Enjoy the entire Switch to Safer series! We all know people who wear makeup, maybe you do too. I definitely do. Whether it’s everyday or just for an evening out, makeup is directly on our faces for a very long time. So, don’t you want to make sure it’s safe? Many of the chemicals we have discussed are lurking in our cosmetics. I tapped into a great post by ReadFoodRN, Kate Doubler. ☠️ BHA and BHT: Synthetic antioxidants used to extend shelf life. They are likely carcinogens and hormone disruptors, and may cause liver damage. Found in: lipsticks, moisturizers, diaper creams, and other cosmetics. ☠️ Bisphenol A (BPA): A hormone disruptor that may also alter DNA, used in plastics and resins. Found in: plastic bottles, lining of aluminum food cans, possibly in eyeshadow and styling gel. ☠️ Ethanolamines (MEA/DEA/TEA): Surfactants and pH adjuster linked to allergies, skin toxicity, hormone disruption, and inhibited fetal brain development. Found in: hair dyes, mascara, foundation, fragrances, sunscreens, dry cleaning solvents, paint, pharmaceuticals. ☠️ 1,4-dioxane: A by-product of manufacturing that is a probable human carcinogen (a known animal carcinogen) as well as toxic to organs and the respiratory system, and a skin irritant. Likely to be present where ethoxylated ingredients like sodium laureth sulfate, PEGs, and ceteareth are listed on ingredient labels. Found in: shampoo, body wash, bubble bath. ☠️ Mercury and mercury compounds (also listed as Thimerosal): Metallic element used as a preservative and antiseptic known to damage brain function. Found in: ear and eye drops; may be used in mascara. ☠️ Parabens (methyl-, isobutyl-, propyl- and others): A class of preservatives commonly used to prevent the growth of bacteria and mold. Parabens are endocrine (or hormone) disruptors, which alter important hormone mechanisms in our bodies. Specially, parabens mimic estrogen; they can lock on to our cell’s own estrogen receptors and mess with important natural signals. They may play a role in triggering breast cancer. Found in: shampoo, face cleanser, body wash, body lotion, foundation. ☠️ Phthalates (DBP, DEHP, DEP and others): A class of plasticizing chemicals used to make products more pliable or to make fragrances stick to skin. Phthalates disrupt the endocrine system and may cause birth defects. Found in: synthetic fragrance, nail polish, hairspray. ☠️ Retinyl palmitate and Retinol (Vitamin A): A nutrient that may damage DNA and speed the growth of skin tumors when used topically. Found in: moisturizer, anti-aging skincare. ☠️ Sodium Lauryl Sulfate and Sodium Laureth Sulfate (SLS and SLES): SLS and SLES are surfactants that can cause skin irritation or trigger allergies. SLES is often contaminated with 1,4-dioxane, a byproduct of a petrochemical process called ethoxylation which is used to process other chemicals in order to make them less harsh. Found in: shampoo, body wash, bubble bath. ☠️ Synthetic flavor or fragrance: An engineered scent or flavoring agent that may contain any combination of 3,000+ stock chemical ingredients, including hormone disruptors and allergens. Fragrance formulas are protected under federal law’s classification of trade secrets, and therefore can remain undisclosed. Found in: all types of cosmetics. Contain none of the scary chemicals above! 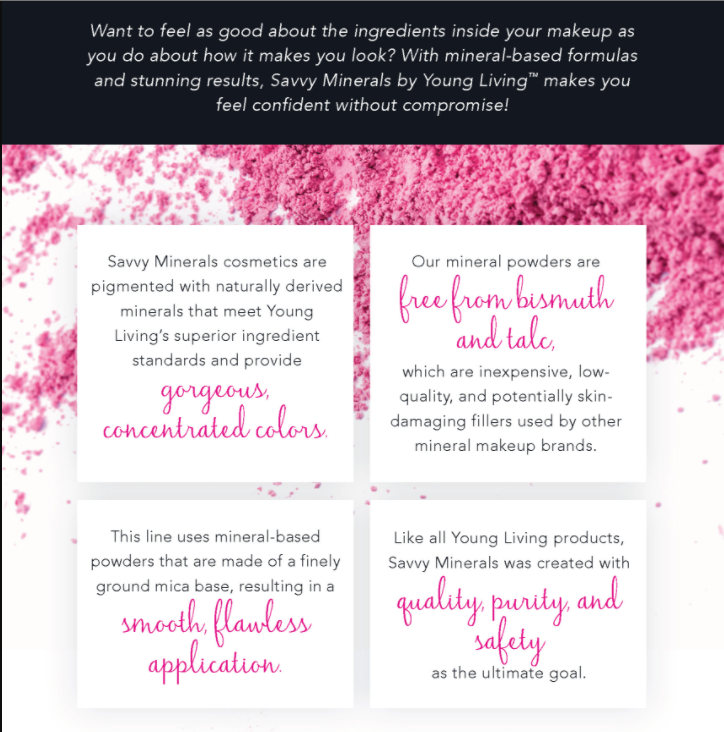 Mineral-based makeup is much safer than chemical based. 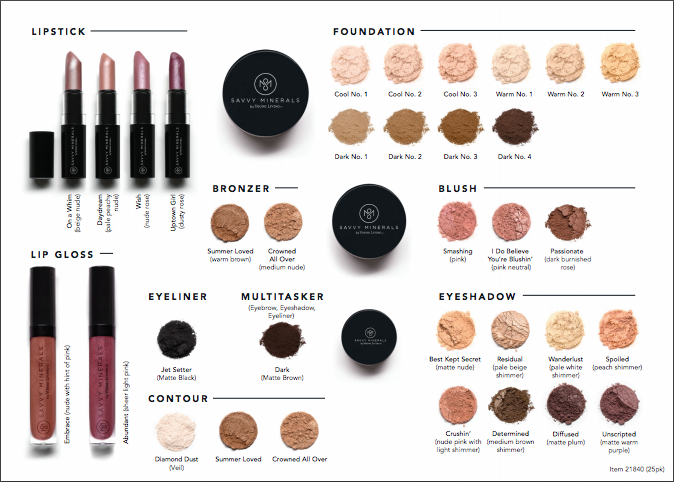 However, you often still find a few ingredients in mineral-based makeup that you want to avoid — and isn’t in Savvy Mineral Makeup! Talc is a mineral substance made up of mainly magnesium, silicon and oxygen used in a variety of cosmetic and personal care products such as baby powder, body and shower products, lotions, feminine hygiene products, eyeshadow, foundation, lipstick, deodorants and face masks. Research has found a direct link between talc and ovarian cancer. Bismuth Oxychloride is a naturally occurring element found in nickel, tin and silver and is primarily used to manufacture metal by-products. It’s also known for its distinct shimmery, pearlescent appearance and its adhereance to skin. Many women will experience itchiness when wearing products containing bismuth, most noticeably when they sweat. This can often lead to nasty rashes and severe acne. Also, we can’t forget Bismuth resembles arsenic chemically. The government protects manufacturers’ “Trade Secrets” by letting them keep certain ingredients secret. Manufacturers can hide thousands of chemicals under the term “fragrance”. So, what are you waiting for? 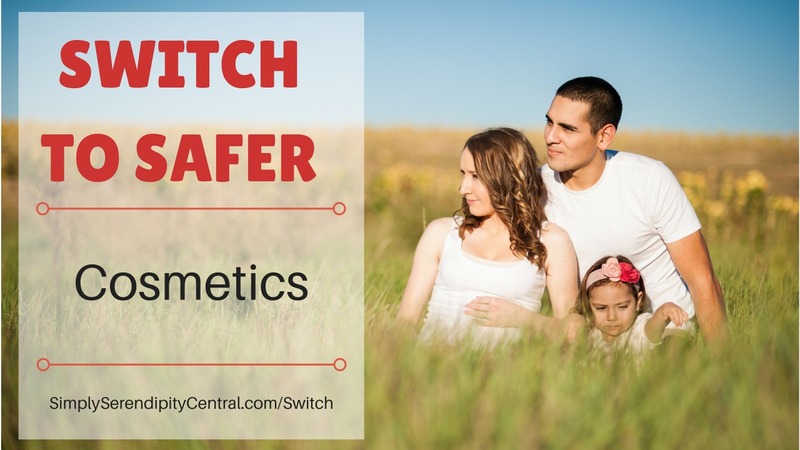 It’s time to Switch to Safer! 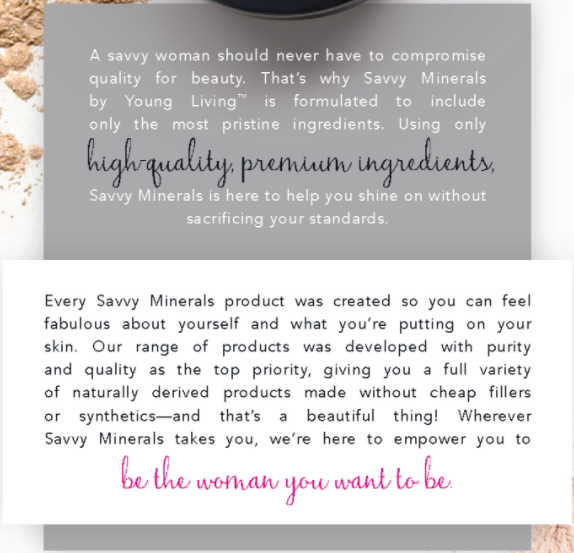 It’s time to add Savvy Minerals to your morning routine! Take our FREE E-course to learn how essential oils could JUST be the simple solution to your common concerns! Simple Solutions to 10 Common Concerns. Like our Facebook page. Simply Serendipity Central. Find out how to buy essential oils at wholesale, 24 % off retail prices!